Yey! 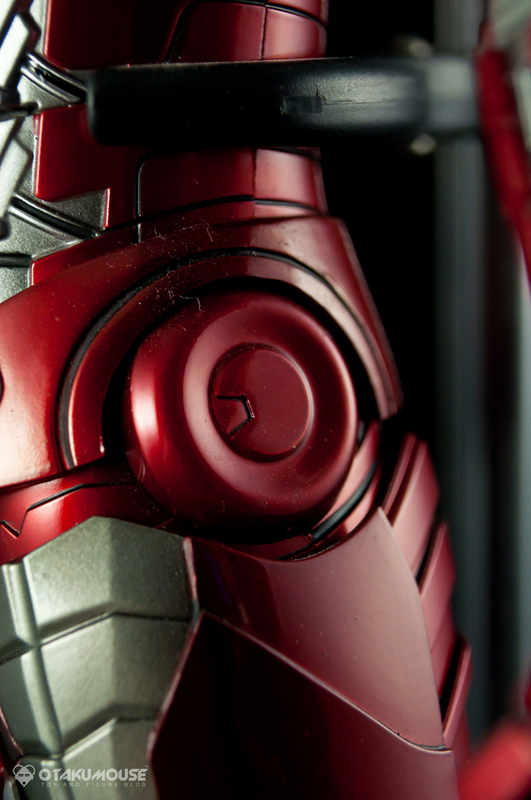 Just finished setting up my full figure review of the Ironman Mark V by Hot Toys. Sorry for the late update specially in the figure review department -_- Was really busy with work this past few months (as always). 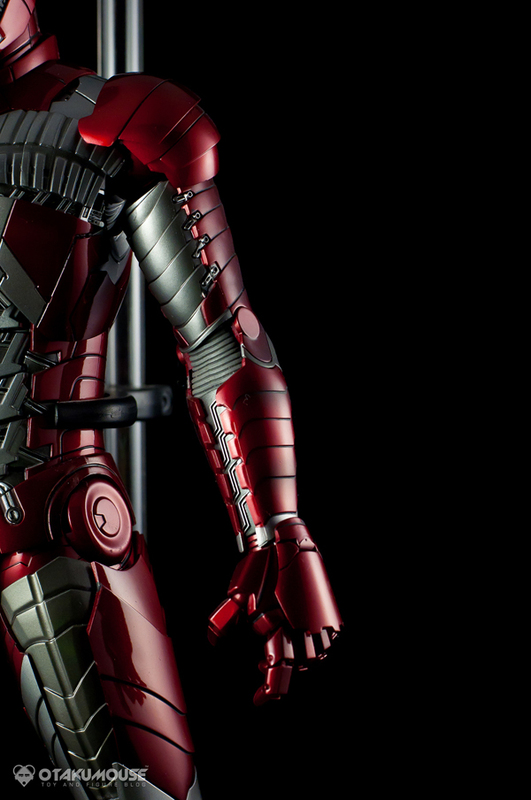 Enough excuses and let’s take a look at this very magnificent figure rendition of the Mark V armor from the 2nd Ironman film. 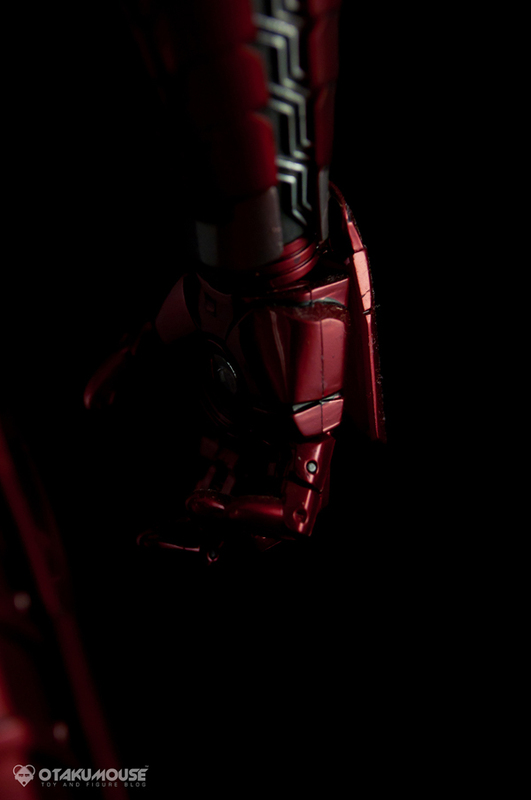 When the feature trailer of the 2nd Ironman movie was announced, the last scene was the one that made the whole trailer awesome. 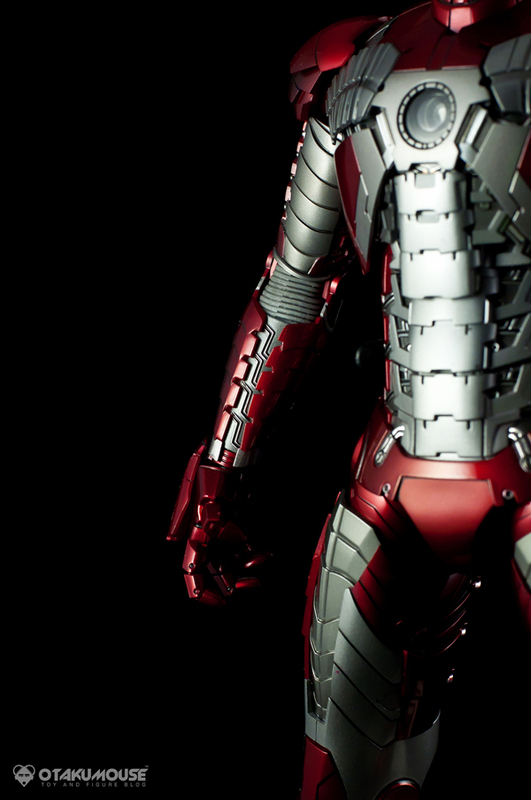 It gave us a glimpse of the classic suitcase armor that Tony Stark is using in the comic books. 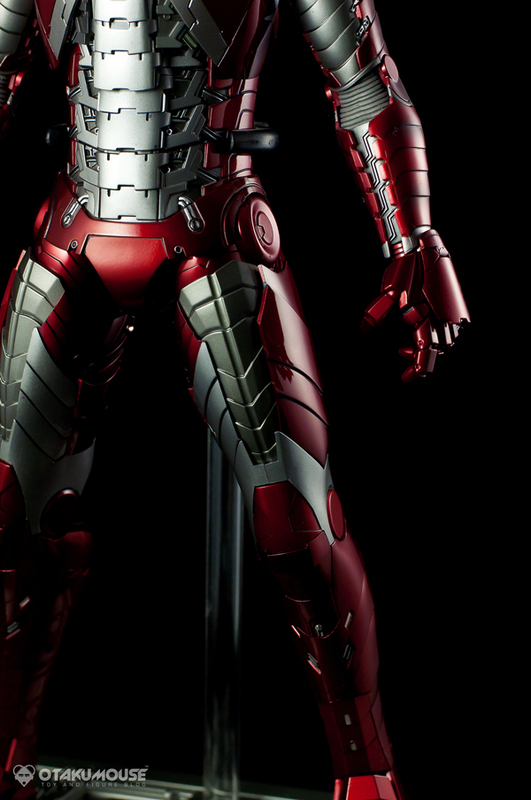 The moment I saw that part of the film, I’m still unsure if Hot Toys will create a figure rendition of that armor. 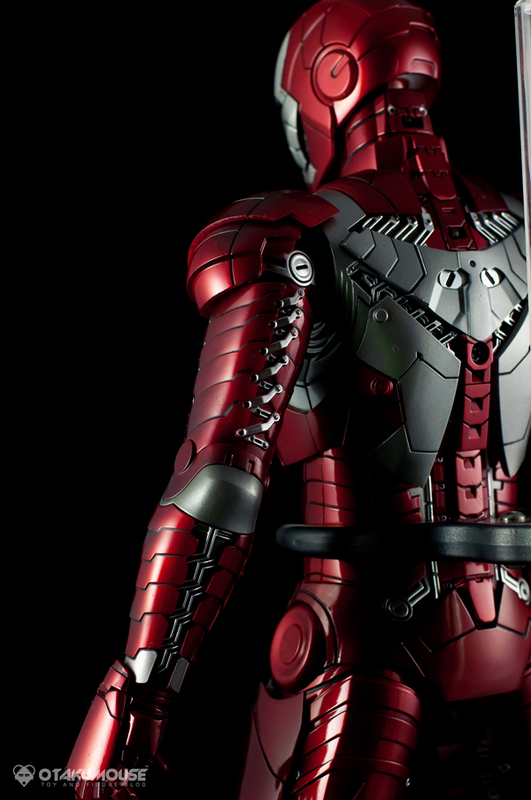 A couple of weeks after the 2nd Ironman film, HT rolled out their updated Ironman 2 figures. 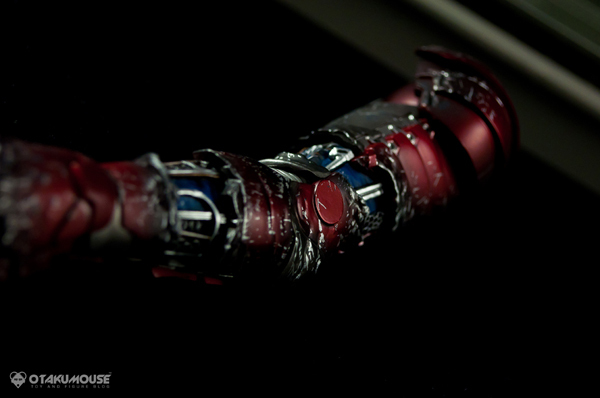 These includes the Mark IV, Mark VI, and the highly anticipated Warmachine. 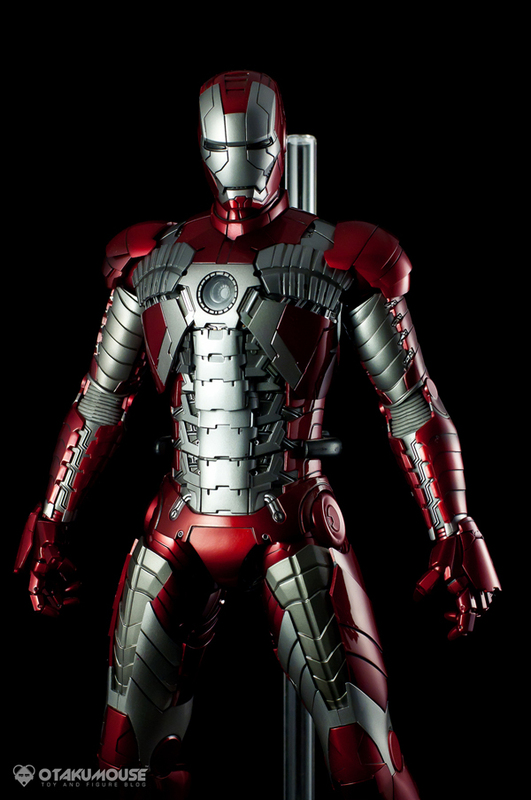 But one figure rendition is missing in their press release at that time, and yes, it’s the Mark V suitcase armor. 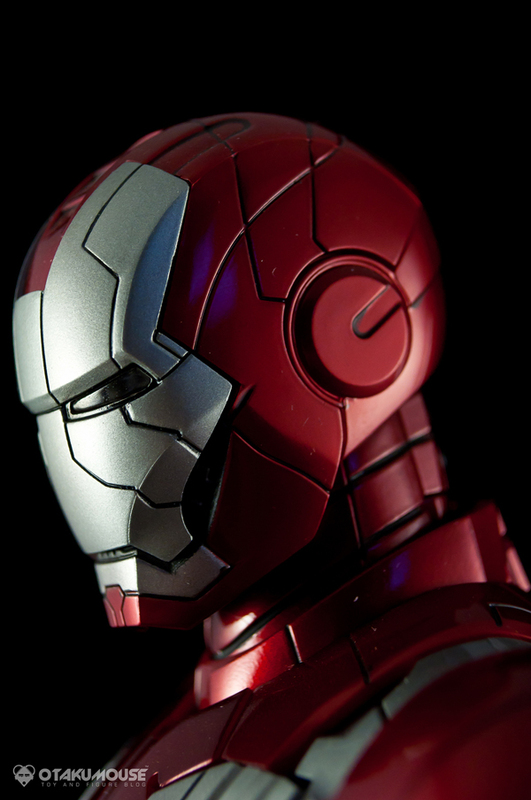 All hope is lost for figure collectors who wants the Mark V to be transformed into a detailed action figure. 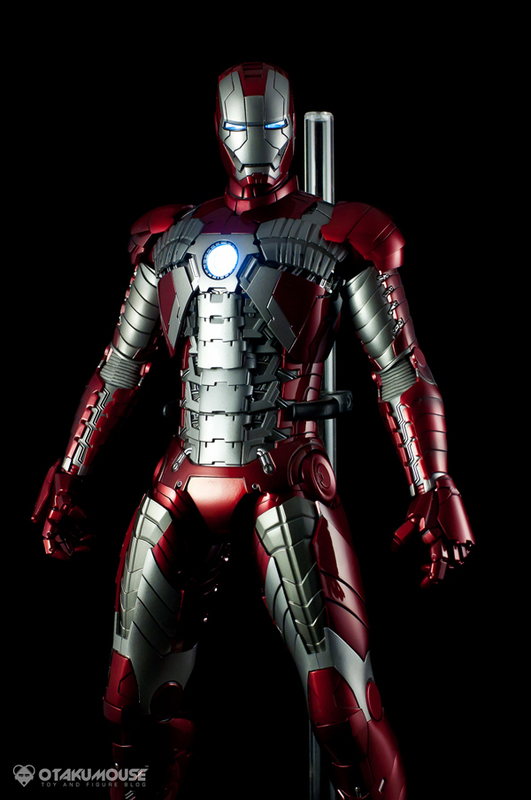 Fortunately, HT listened to their fans and they’ve rolled out the prototype shots of the actual Mark V figure. I was floored the moment I saw the figure. 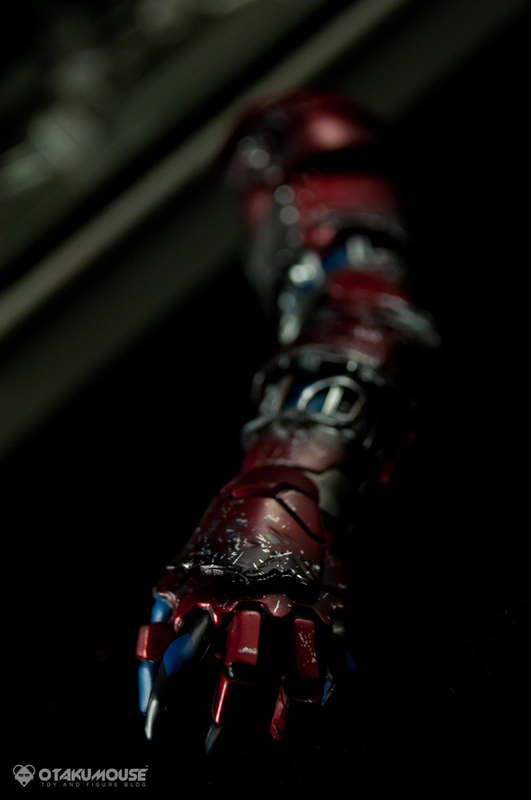 The details were incredible. It’s a no brainer for figure collectors like me and I instantly hit the preorder button. I already have this figure for a few months now so this review is kinda overdue :P But yeah, as always, this blog of mine is about sharing my figure collection to the whole world through imagery. Enough talk and let’s take a look at the figure! 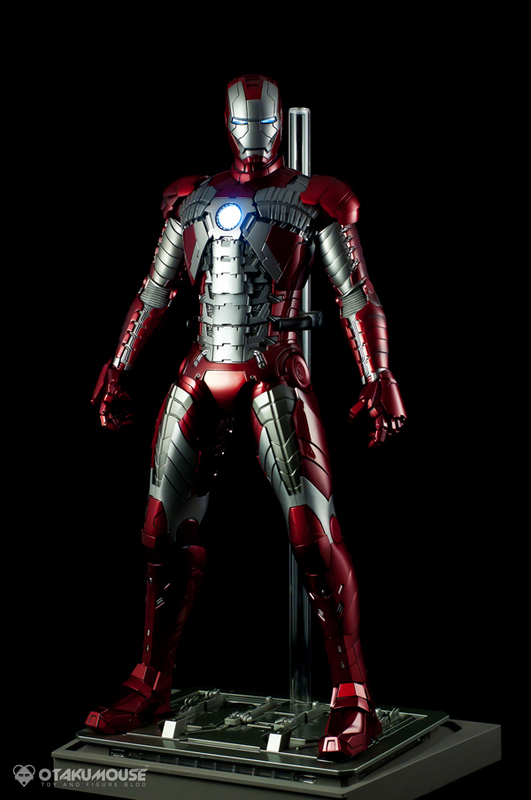 This is I think the most coolest Ironman figure released so far by Hot Toys. 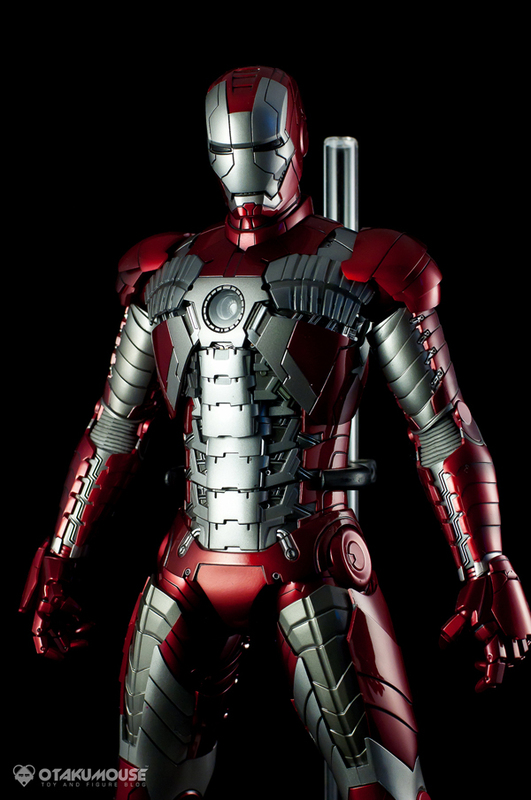 As with any previous Ironman figures. 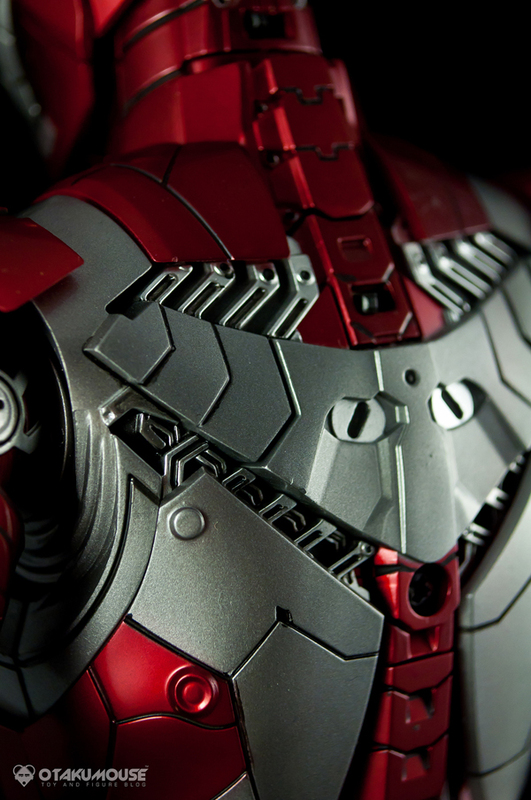 It features LED lighting for the Chest (Arc Reactor), the eyes, and both of the figure’s palms (repulsors). I forgot to switch the palm lights on in this shot. But yeah, it lights up! Overall sculpt of the figure is just AMAZING! 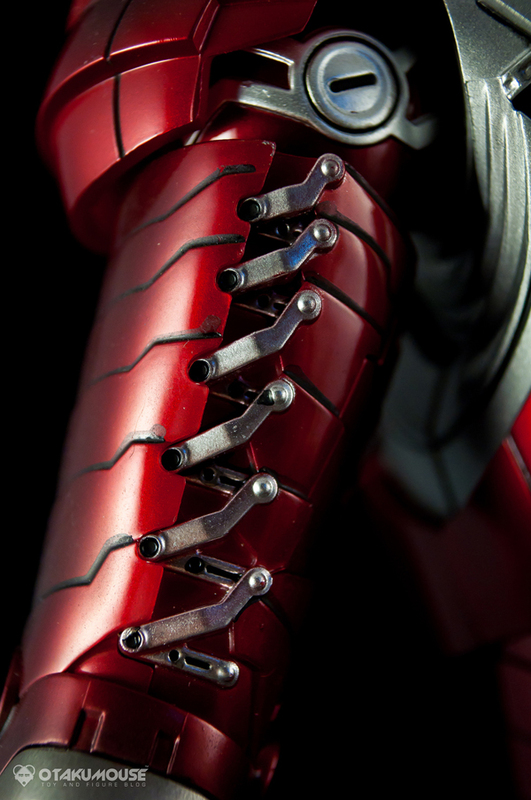 The level of detail in this figure is incredible due to the armor’s design. 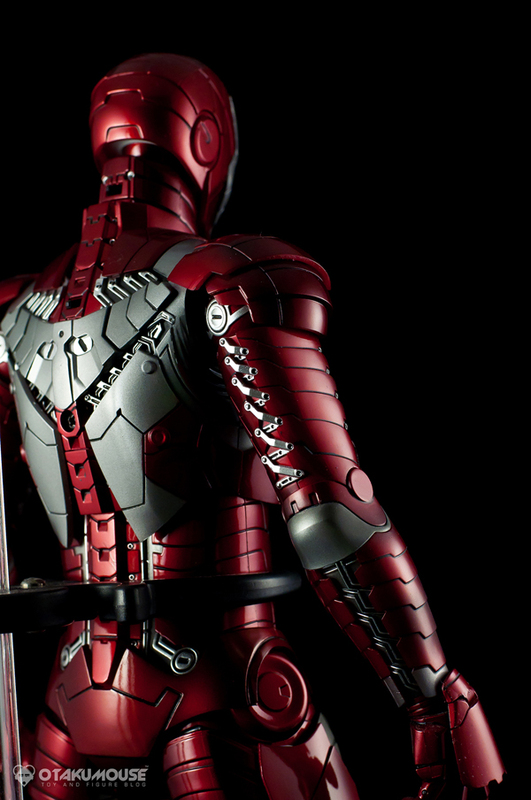 In the film, the armor was composed of a LOT of moving parts and that is pretty evident in this figure. 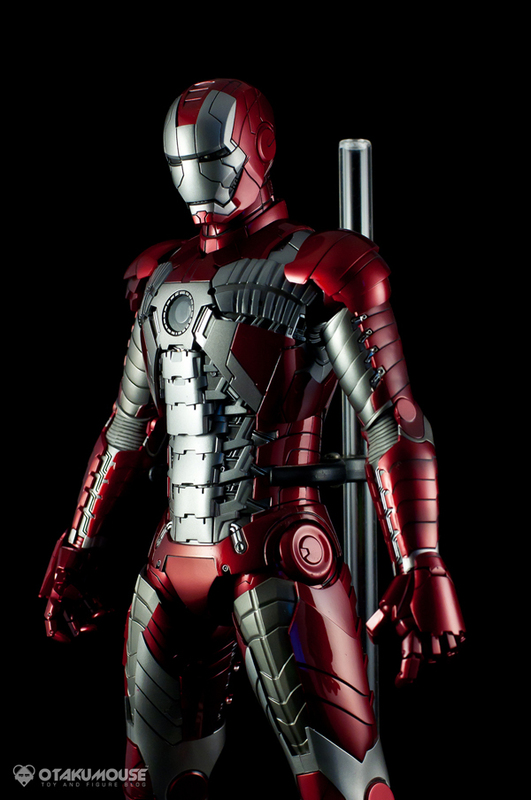 The figure really shows the technicality of the Mark V suit and you can basically see how the armor is formed from the suitcase. 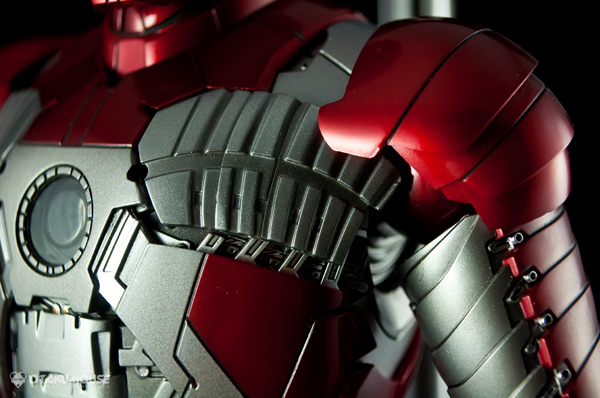 Every single detail of the armor was accurately sculpted into this magnificent figure. And yes, screws included. Articulation is ok though I’m really not a fan playing with the figure’s numerous articulation. I’m kinda scared of breaking a 200+USD figure in the process. 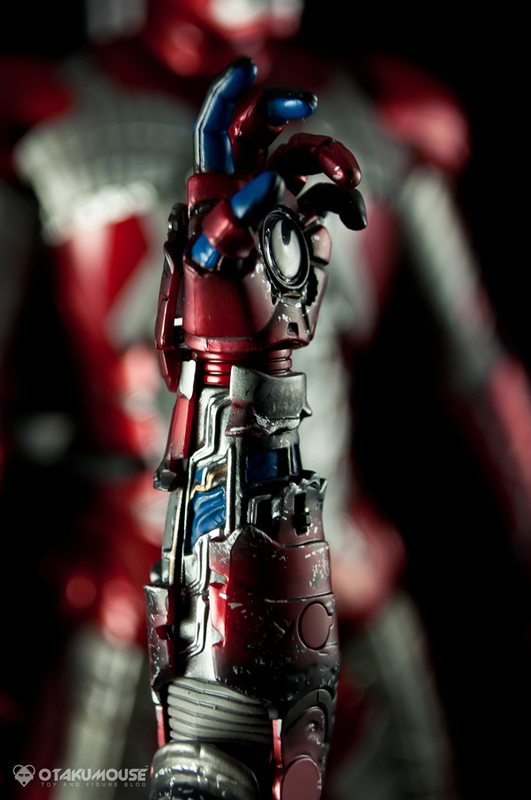 I really enjoyed shooting this figure. 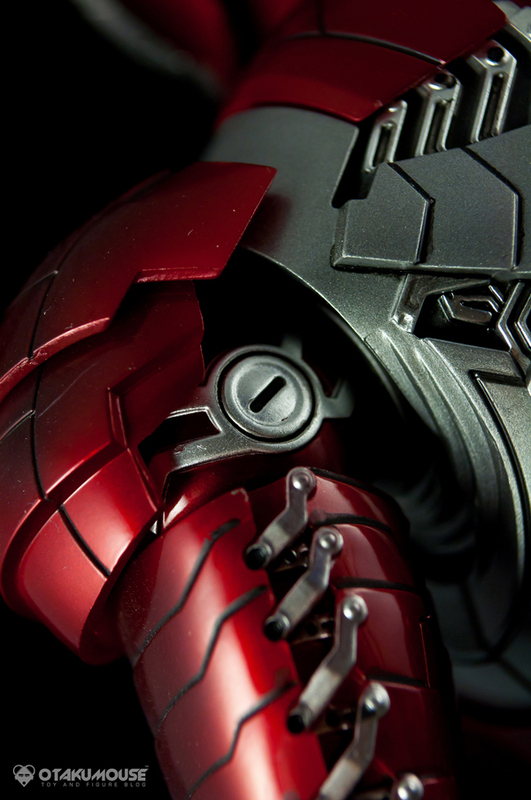 It contains a lot interesting parts and details. 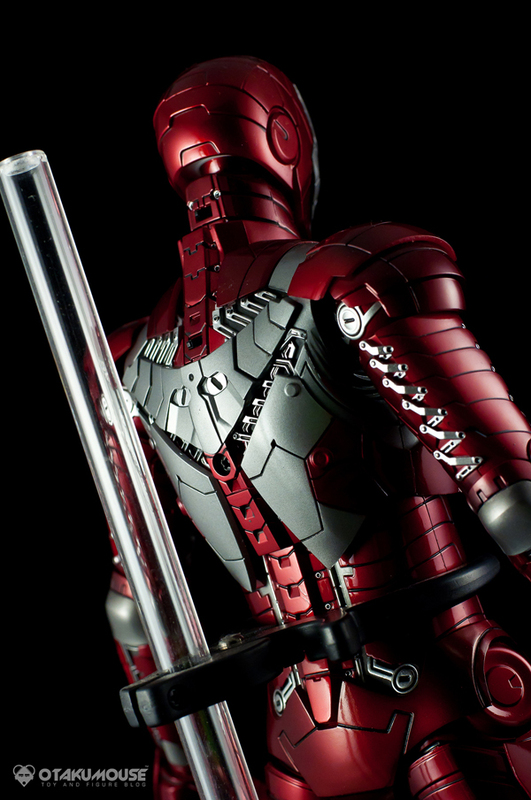 You will really appreciate the quality of the figure through high quality images like these. I lost count of the times a repeatedly browse these images in my computer. Figure is just magnificent to look at. Figure comes with a lot of replacement parts. 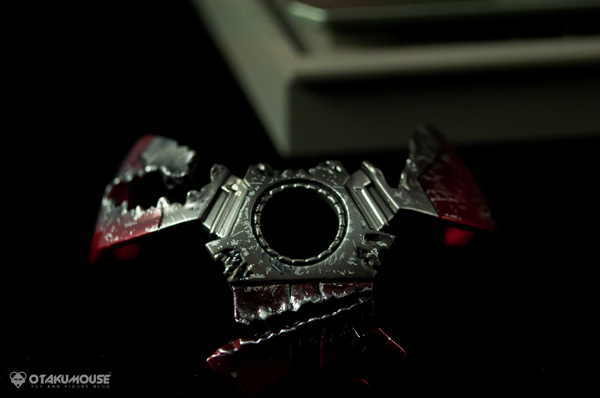 Specifically the battle damaged version. 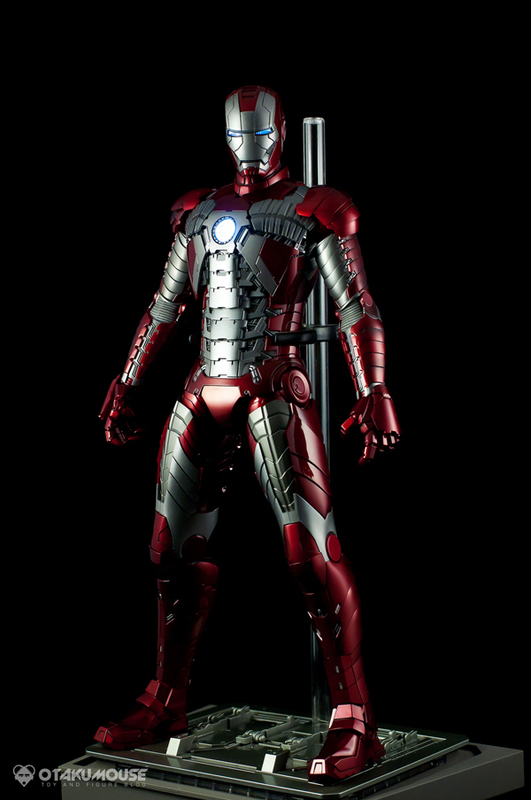 Like previous Ironman 2 figures released by HT. 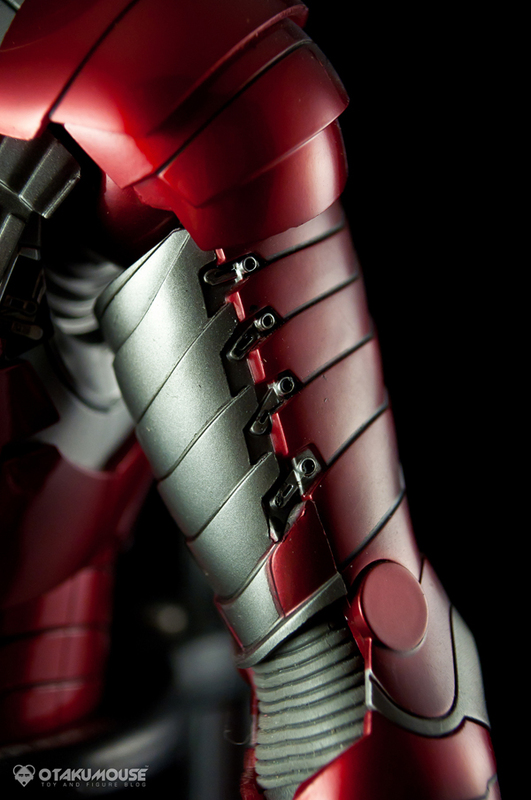 This figure also has the very same articulation system on its torso. 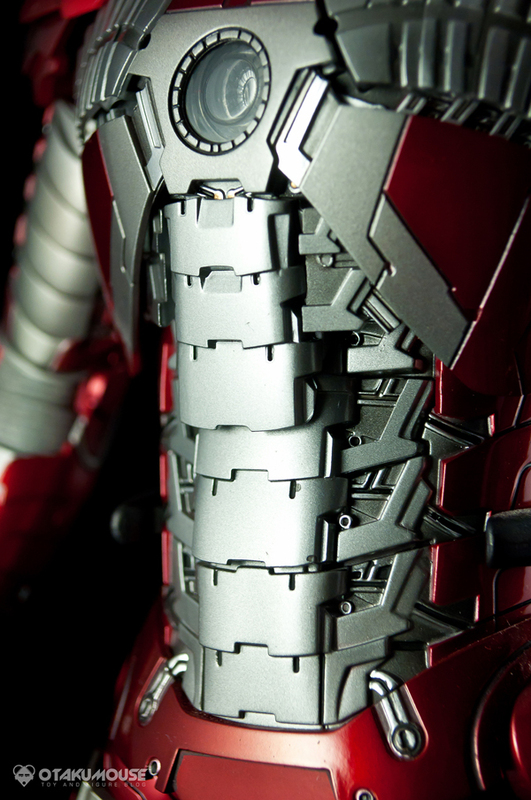 The torso is composed of individual “plates” that adjusts seamlessly based on its position. Pretty nifty. Don’t overdo it though to avoid breaking something inside. 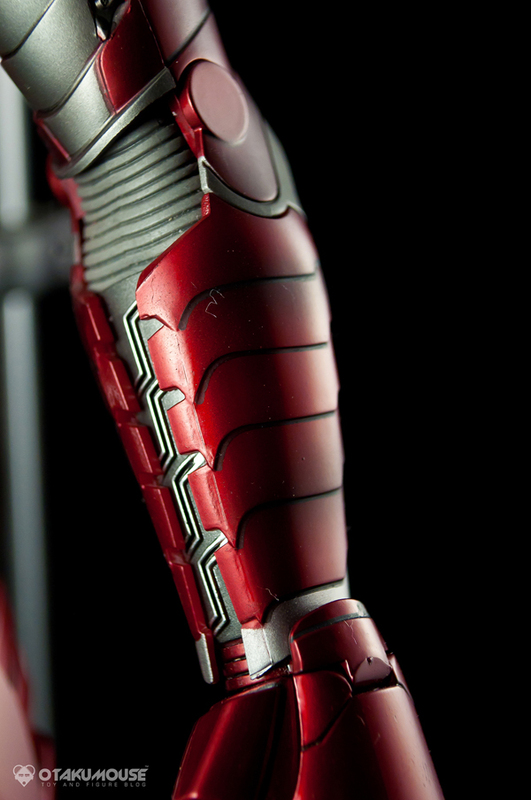 Arms are well articulated too. 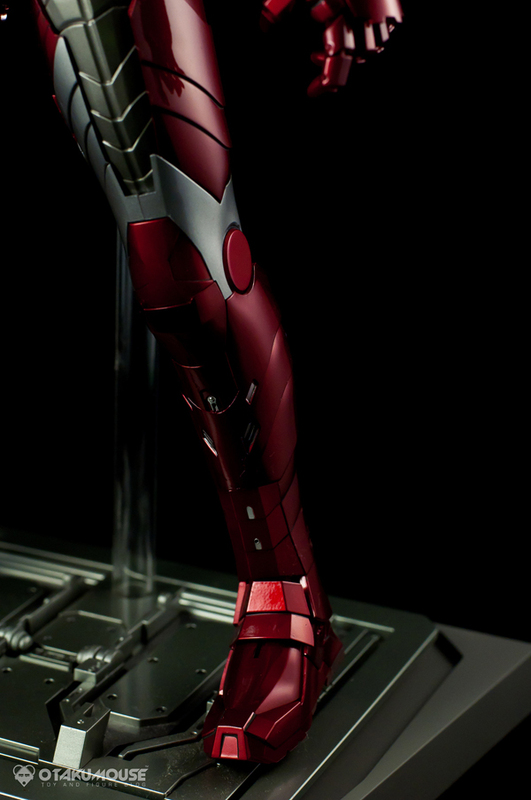 Though I’m having a hard time replicating the pose where his arm is stretched ready to fire his repulsor beams. I tried it but it doesn’t look good. 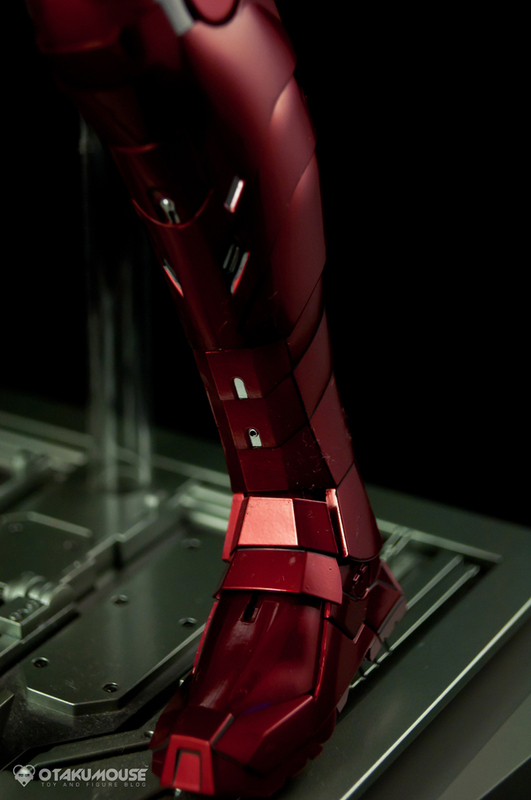 One of the parts of the figure where I’m really impressed is its arms. Legs are well articulated too, but I don’t really bother playing with the figure’s legs since I pretty much display it standing up. 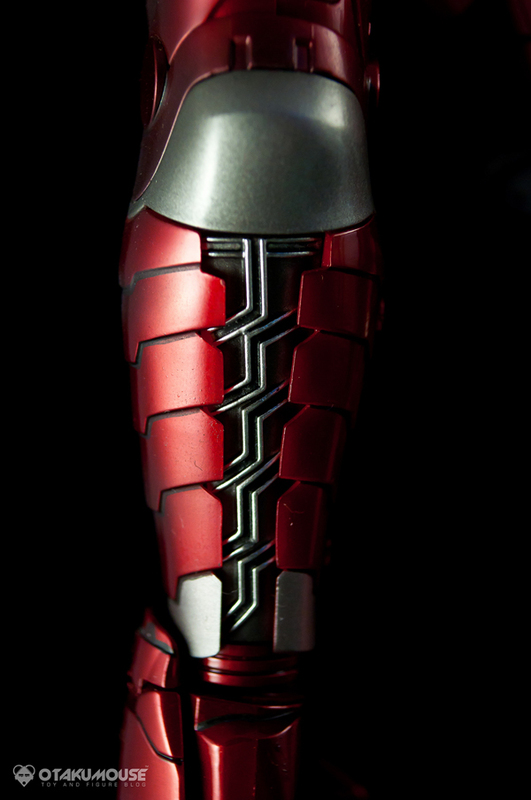 Details on the legs are sculpted perfectly. 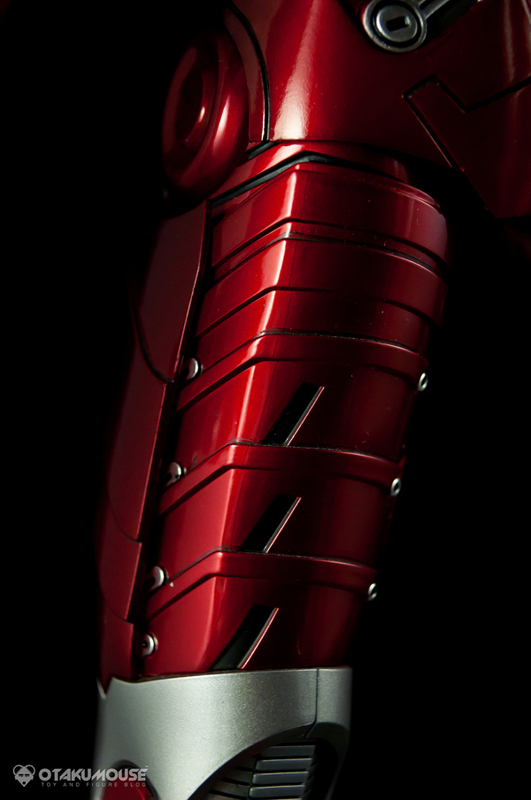 Most of the technical details of the armor can be found on the back since this is the place where the armor “snaps” together in place. 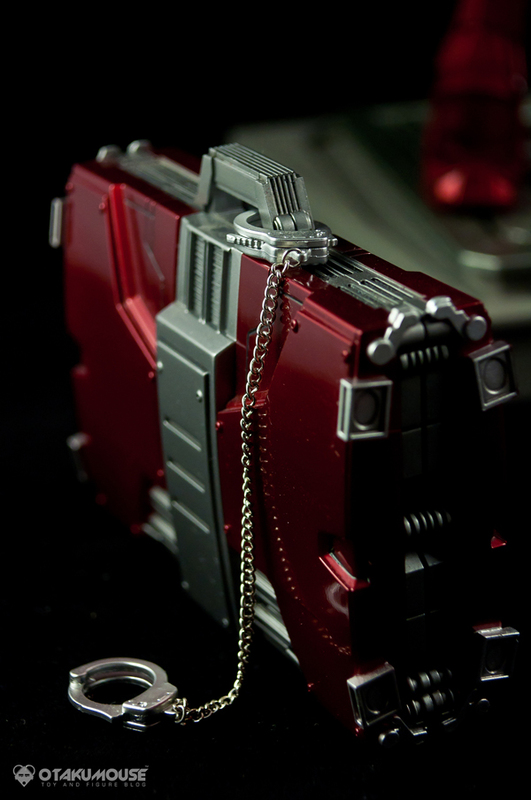 This is actually the first time I saw the hidden details of the figure, behind the camera lens. This is my favorite part. 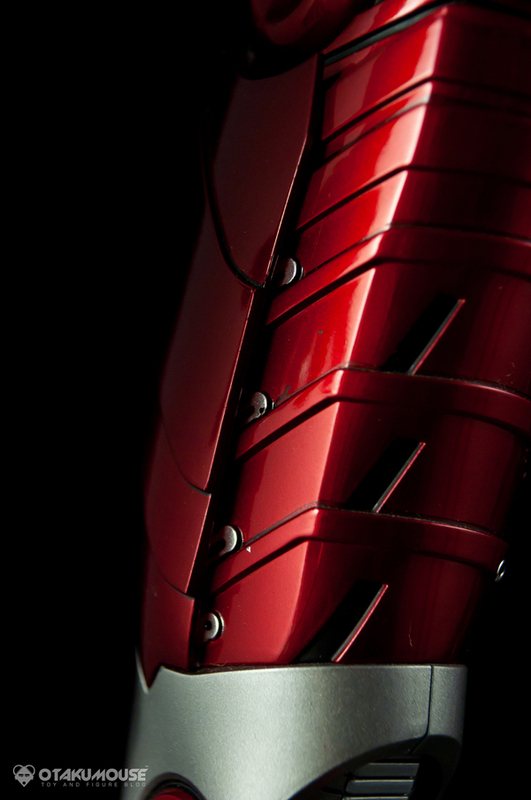 The intersection of the armor assembly at the back of the arms. More detailed macro shots later. 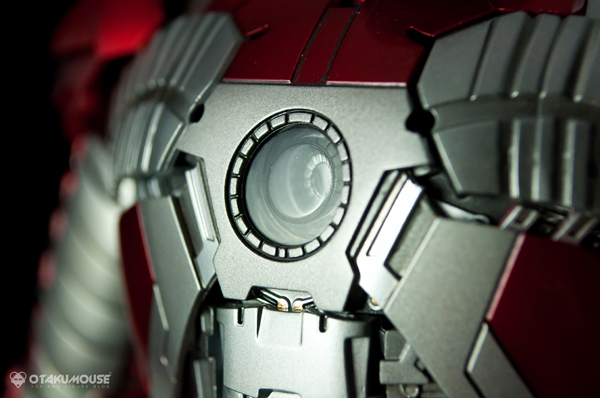 At the back is also the LED switch for the head which lights up the eyes. 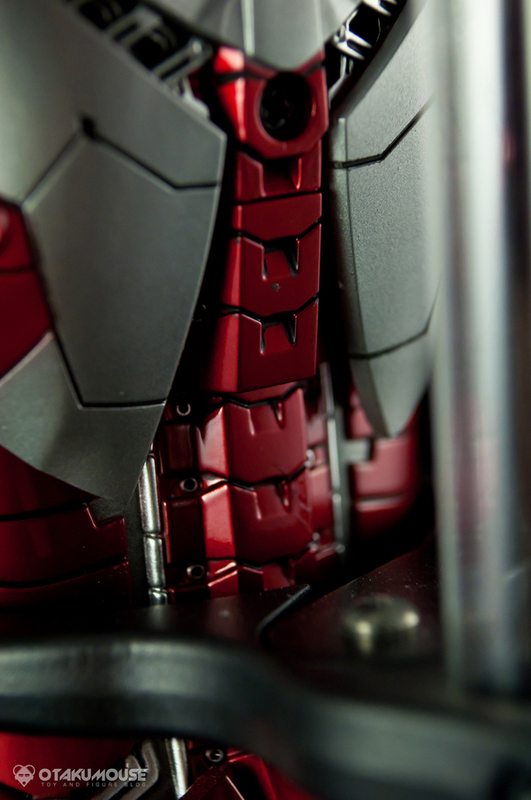 Head details are also top notch. 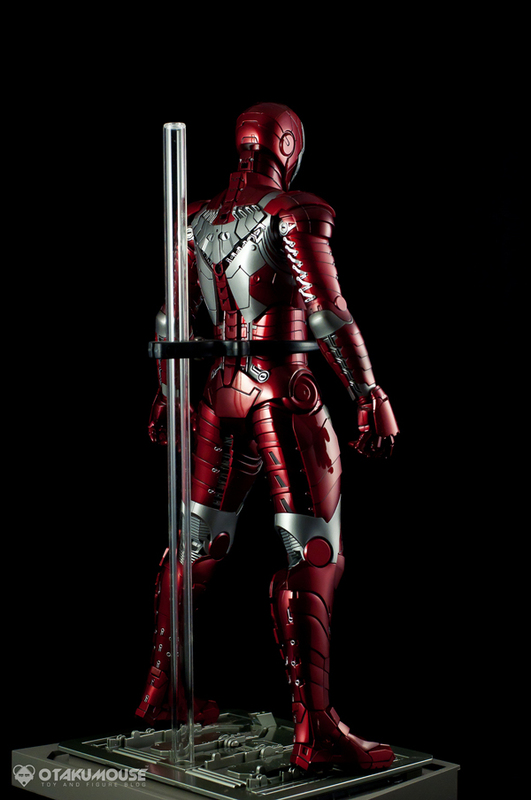 Unfortunately, the figure doesn’t include an optional head like the previous Ironman figures released by HT. 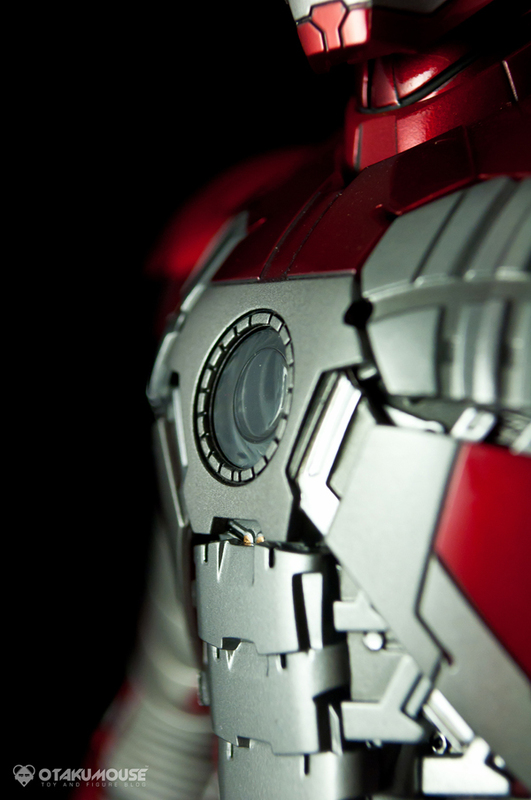 The LED powered arc reactor. Switch can be found at the back. 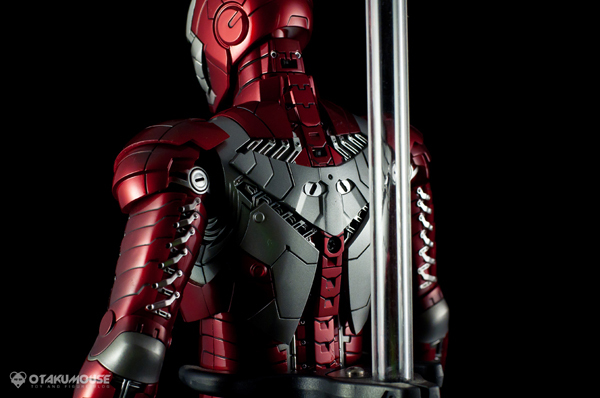 The placement of the LED switch was seamlessly integrated in the overall armor design which is great. 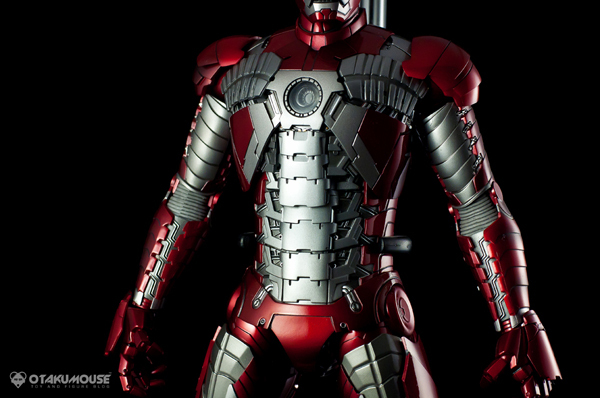 Chest armor can be replaced by a battle damaged version which I will show in later images. HT did a great job in improving the torso’s articulation. 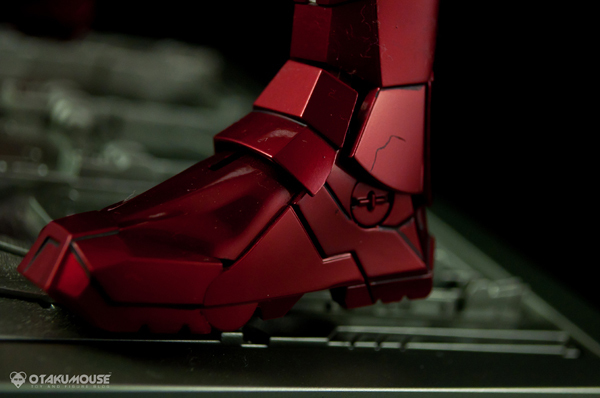 The torso movement is more manageable than previous Ironman figures. It’s also less scary to play with. 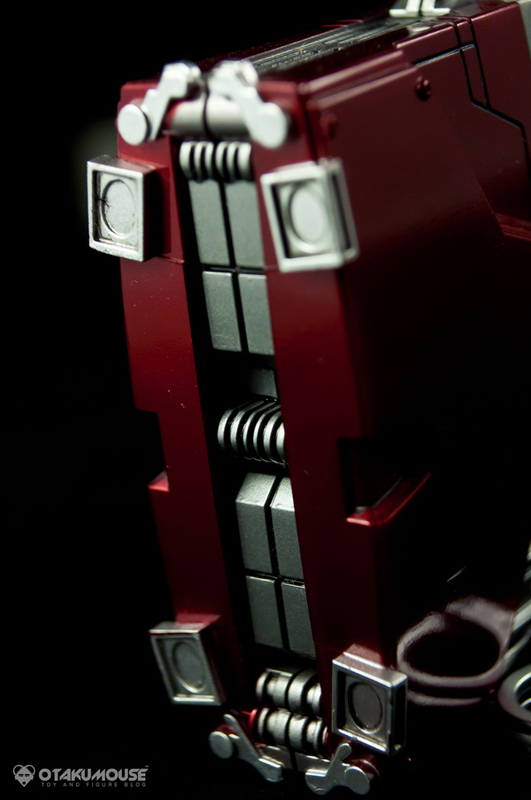 Some detailed macro shots ahead. 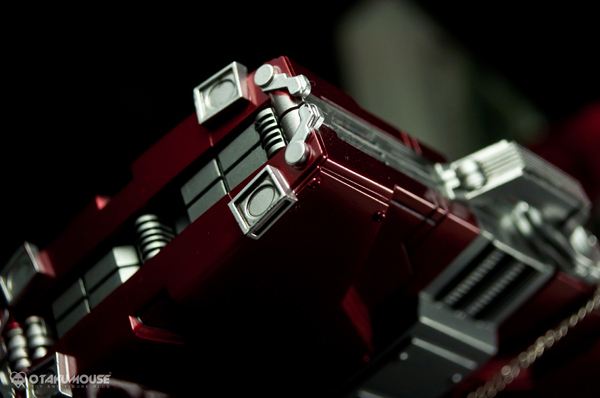 LED powered repulsors. Forgot to switch it on in this shot. 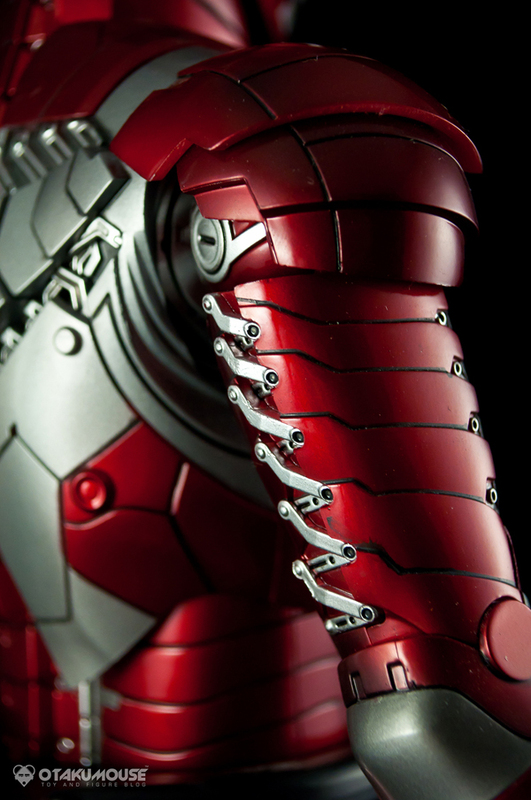 Incredible details at the back of the arms. How the hell did they do that?!?! Let’s talk about the paint job. 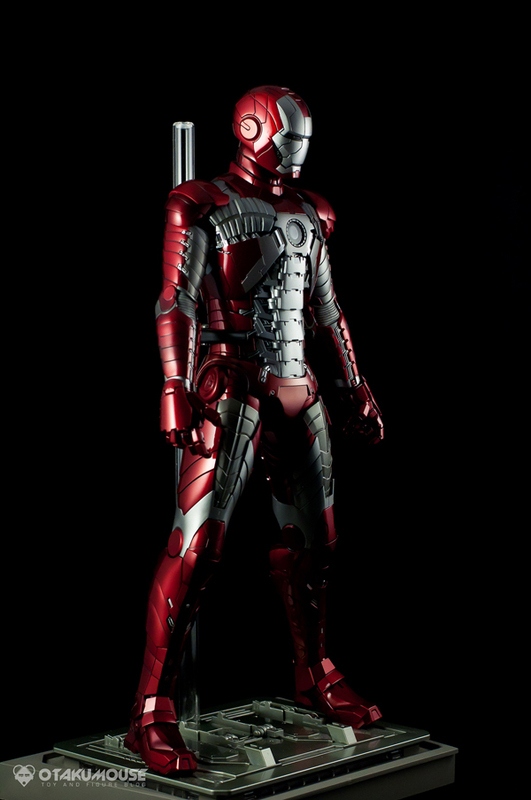 HT never fails in the paint job department and that is pretty evident in this figure. 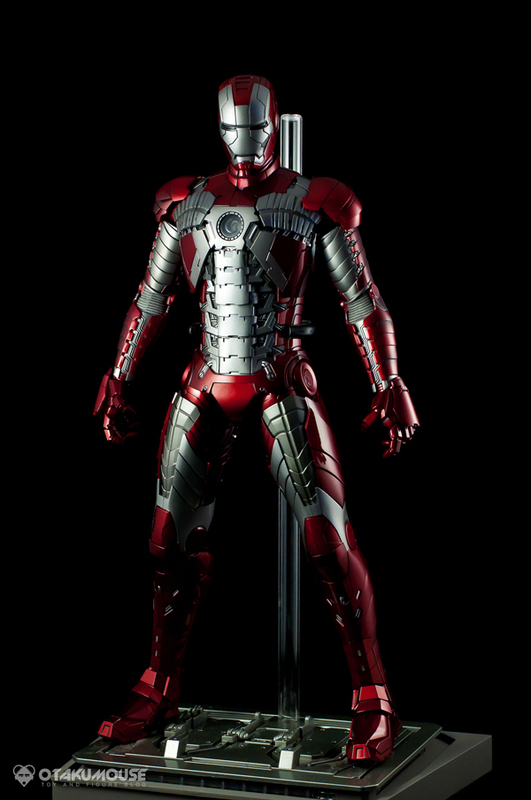 The red + silver color combination of the armor makes it even more badass. 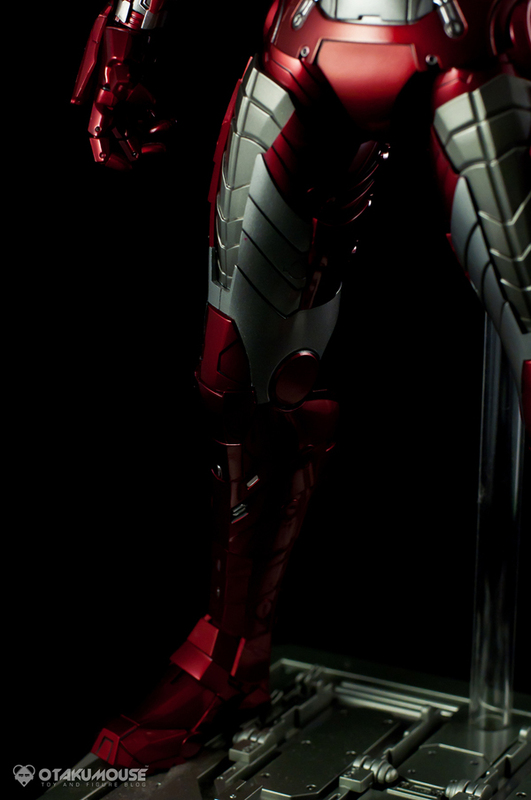 There are some paint bleeds here and there but nothing too serious that affects the overall quality of the figure. 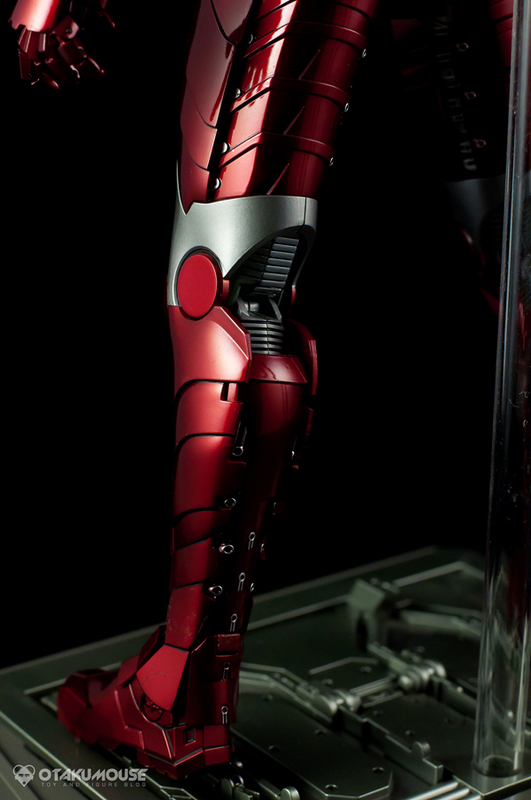 Figure’s left arm can be replaced with this damaged version. 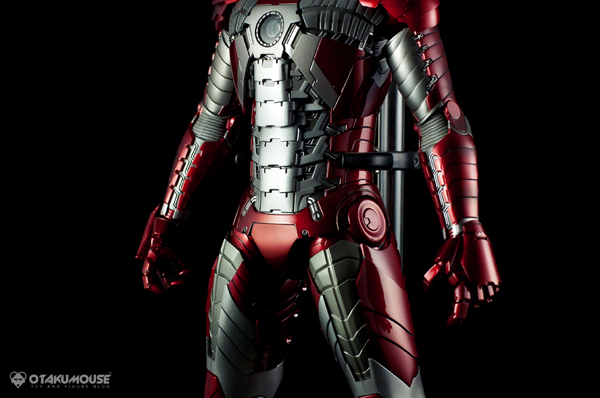 In the 2nd film, Tony Stark was attacked by Whiplash while participating in a race. 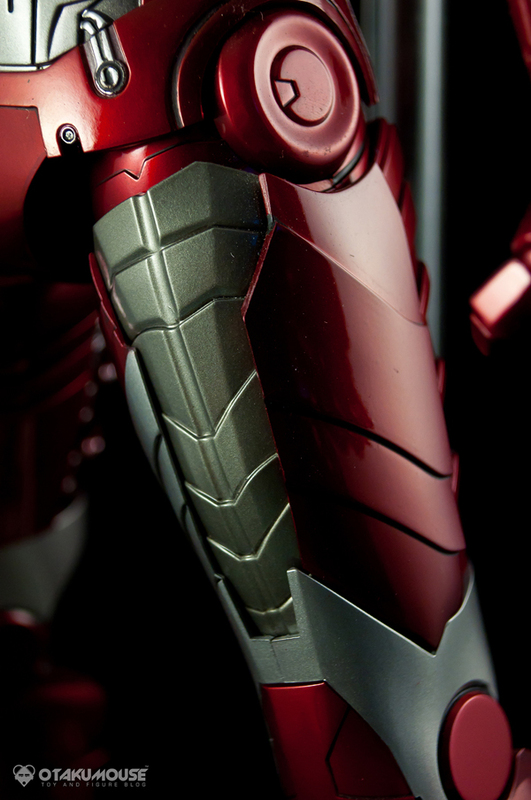 The battle damaged parts included in the figure shows Tony’s blue racing suit underneath the damaged armor. Sick! Battle scars and damage details looks incredible! 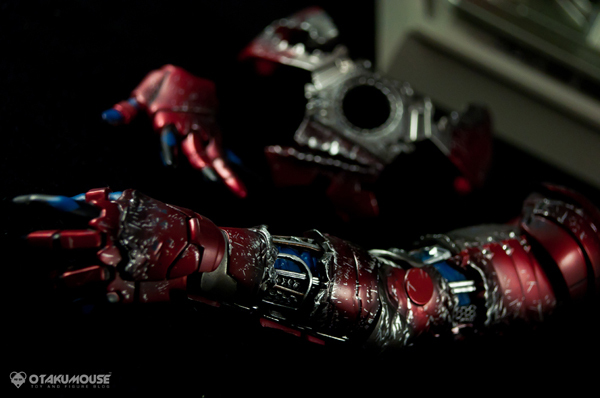 Though I prefer to display the Mark V undamaged. 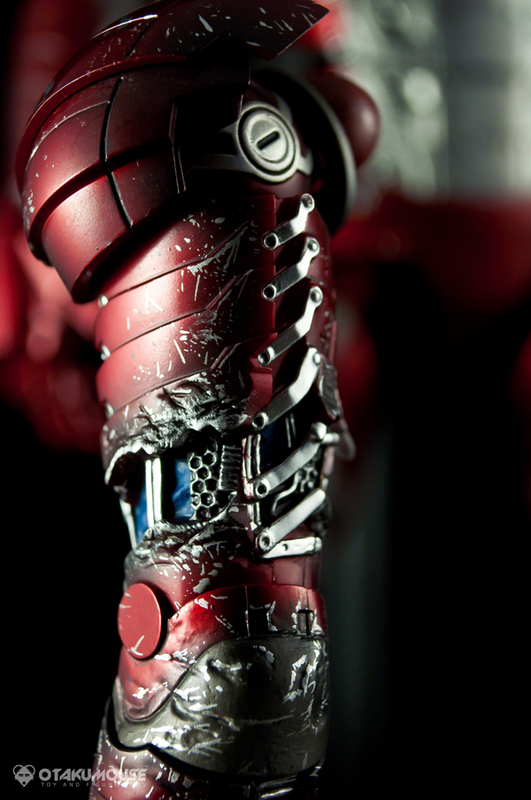 The battled damaged left arm is also LED powered. You can clearly see the LED light switch in this image. 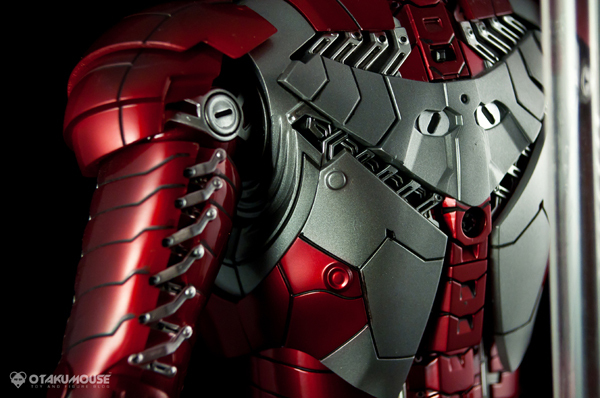 Chest piece of the Mark V armor can also be replaced by a battle damaged version. And yes, the Suitcase is also included with Happy’s handcuffs of course! 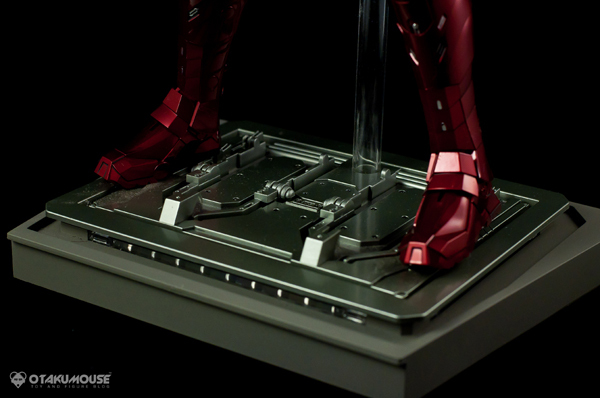 Like the figure, the suitcase also has incredible details. 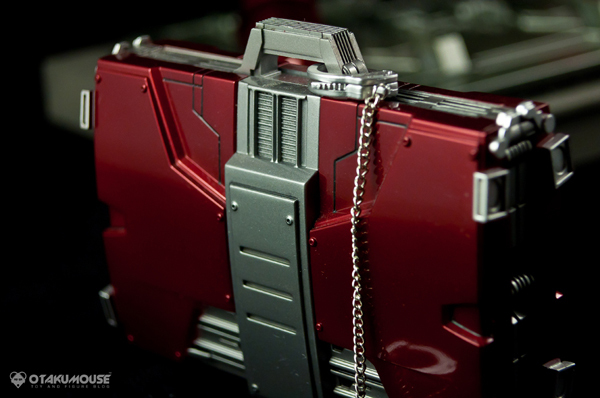 A closer look at the details of the suitcase. This figure contains an impressive amount of detail that a single review isn’t enough. 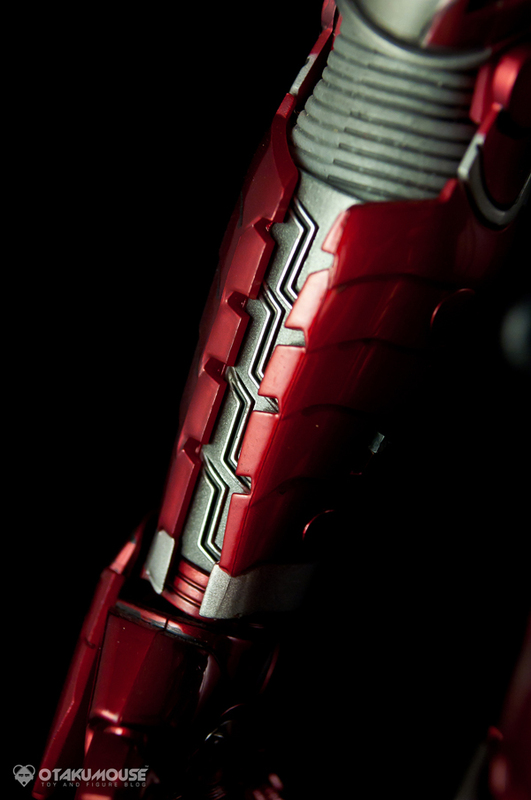 HT really did a great job in transforming the Mark V armor into a high quality detailed figure. I really hate reviewing “mechanical” figures because of the amount of work and time needed to cover all of its features, but I really enjoyed reviewing this one. 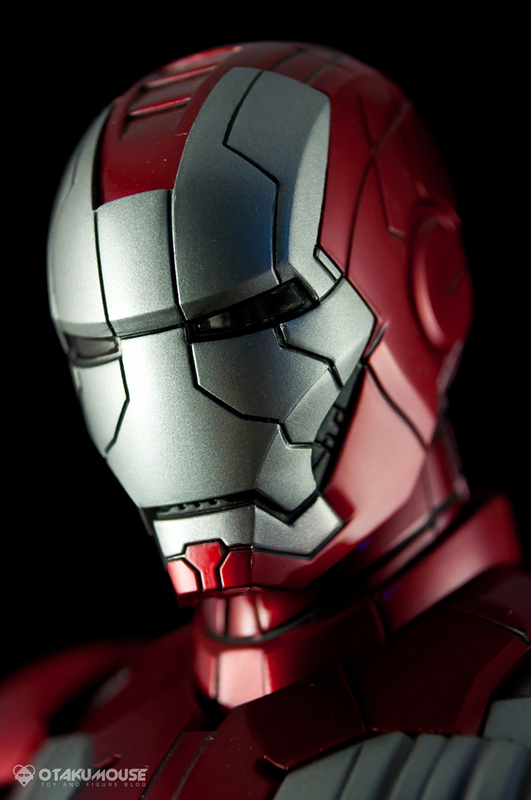 So far, of all the Ironman figures I currently have, this one is my favorite. If you still have the chance to get this figure at a reasonable price, now is the time to make your move and purchase one yourself. The value of this figure is constantly increasing so grab that opportunity while you can. You won’t regret this purchase. 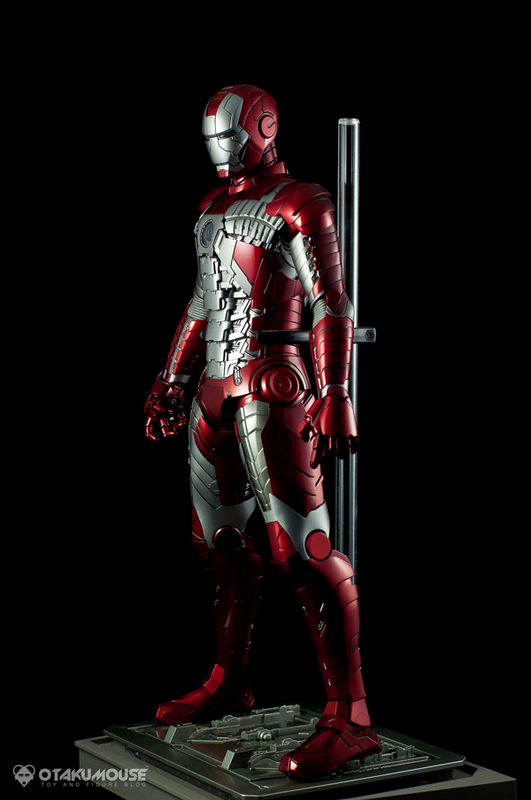 This is a must have figure for all Ironman fans out there, specially fans of the film. I hope you enjoyed this figure review ^_^ Next review coming up so stay tuned! 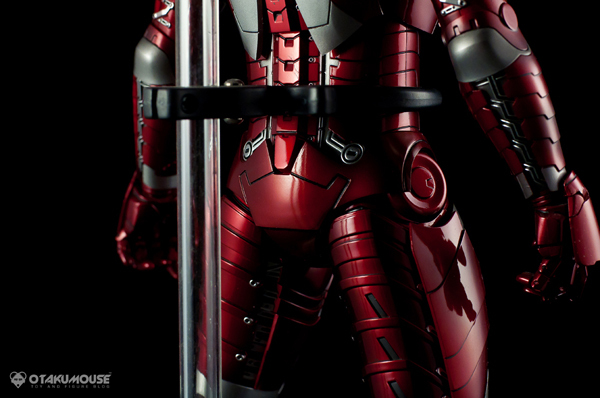 i happen to chance upon your site while doing some searches on images of hot toys iron man. 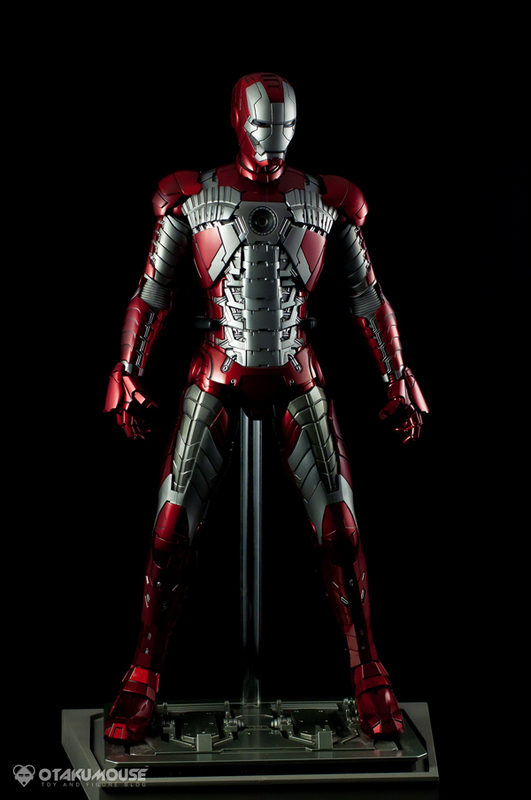 i’m just starting to build up my own hot toys collection and i’ll be picking up my fourth figure today. i must say, you really took great pictures and some of the details you share are really informative. i’m surprise as well because you’re also from the philippines. anyways, keep it up and more power to your site. Thanks much Larsen :) Good luck on your HT figure collection! Those HT figures are one of the best figures out there and it’s worth every penny. Whose your fourth figure btw? 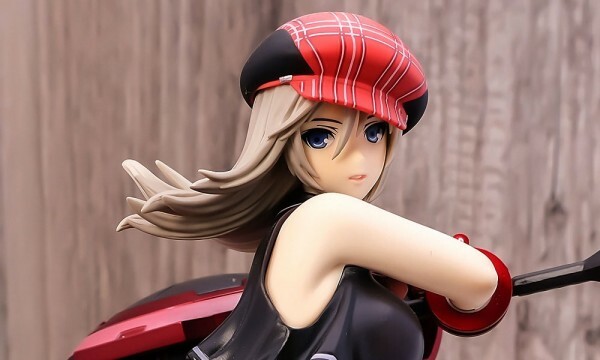 What are your thoughts on figures having poor quality control? For an instance, like paint issues, defects, broken or chipped parts? I personally have a little OCD, and I get really irritated when I see these problems, even if its just a small scratch or chip. I feel you Victor, I’m also like that. Sometimes, this quality controls issues are “out of our control”. 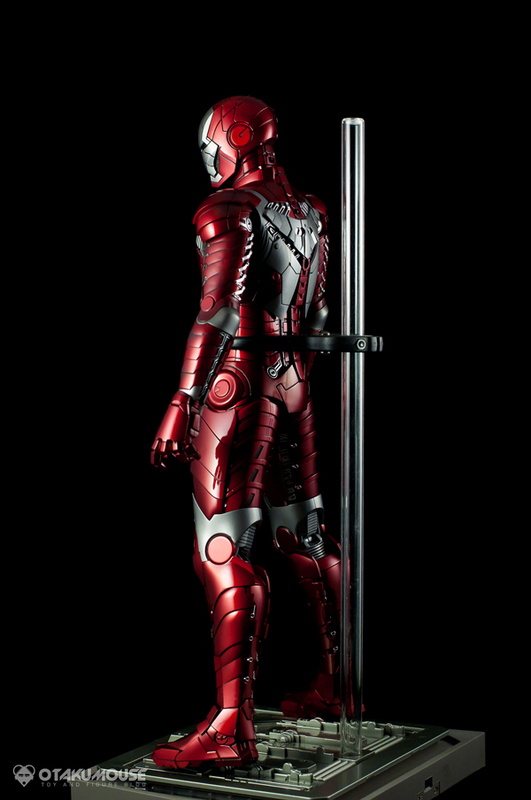 The only thing I do to avoid experiencing this is whenever I buy a new figure in the store, I usually ask the store to open it up for me so that I can inspect for any defects etc. 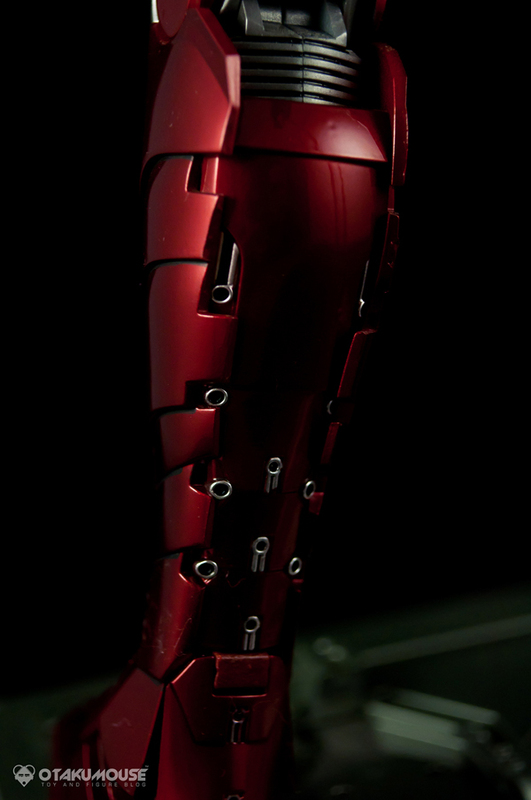 If this is Hot Toys, If I’m not mistaken, for missing parts, they will email you a replacement when you report the issue to them though if you think about it, It’s kind of a hassle doing all those stuff just to have the replacement >_< (email, waiting for their reply, email again, etc...). How do you buy your figures? online? or do you go to the actual store to buy? That is really weird. 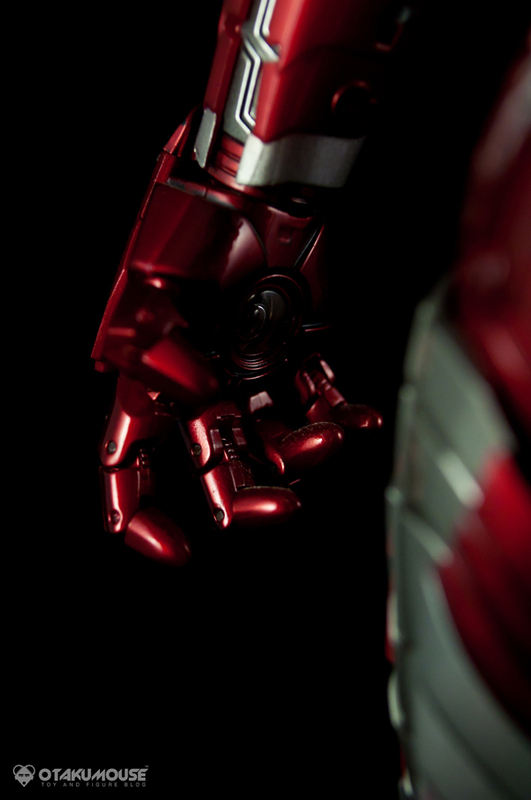 I emailed Hot Toys, many many times about just a normal question of some random figure, and they never responded to me, ever. Anyway about the where I got most my figures, are actually online, ebay, but recently have learned to purchase them better through sideshowtoys.com. Because they are the offical retailer, they at least sometimes could give you discounts and offer money back on some items, but ebay cannot. 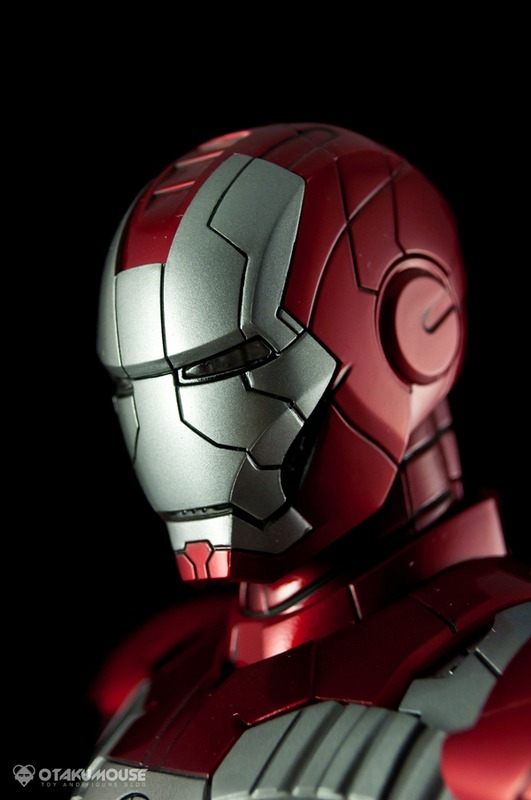 One thing I recently encountered was having to deal with a local toy store which carried HT iron man toys. I traded one of my gundam figures to him, and he literally taught me how to open it without damaging the packaging, so I can sell as new next time around. I bought two figures from him, went home, opened them and found out they were used due to missing plastic wraps, obvious shelf wear on the figure, and missing parts. Sigh…so I guess the safest way is to gamble through sideshowtoys. Because their stock is always brand new and unopened in their “brown box mailer” as they recieved them from HT hong kong. I saw two website that offers nice competitive prices on preorder figures lately, and like to share with you anime-island.com and the other one, ill just have to email you because I forgot…anyway peace! 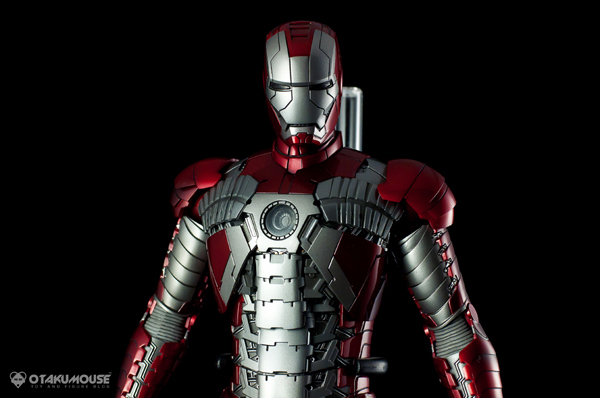 Hi im also a collector from the philippines and i came across your site while looking for hot toys reviews. (good reviews btw) Anyway this is a long shot but would you know where i can still get the hot toys assaassins creed ezio? Ive been looking for that figure and i cant find one at any of the usual shops. You just seem like someone who can help. Thanks and keep up the good work.